Tenneco Inc. supplies the Volkswagen Sharan's semi-active continuously controlled electronic suspension system, which regulates damping levels in accordance with driving conditions. Key to the system - produced in Ermua, Spain - are the continuously variable electro-mechanical valves, which are able to make adjustments within 10 milliseconds. The valves were developed by Ohlins Racing AB, a Swedish motor sport technology specialist. An electronic control unit uses data generated by multiple body sensors and from the in-car network to independently regulate the damping of each shock absorber valve. Tenneco also provides both the Sharan's optional semi-active shocks and the large minivan's standard shocks. In addition, the U.S. supplier contributes shocks for the VW Golf, Scirocco, Passat, Eos and Tiguan. ArvinMeritor Inc. provides the Sharan's sunroof. The optional fit is three times larger than a standard sunroof. Peguform GmbH produces the Sharan's front and rear bumpers, radiator grille and assembles and delivers the front-end module just-in-sequence to VW's plant in nearby Setubal, Portugal. The second-generation Sharan shares its platform with the new Seat Alhambra. Both vehicles are assembled at the VW Group's AutoEuropa plant near Lisbon. VW plans to make 50,000 Sharans and 27,000 Alhambras a year. 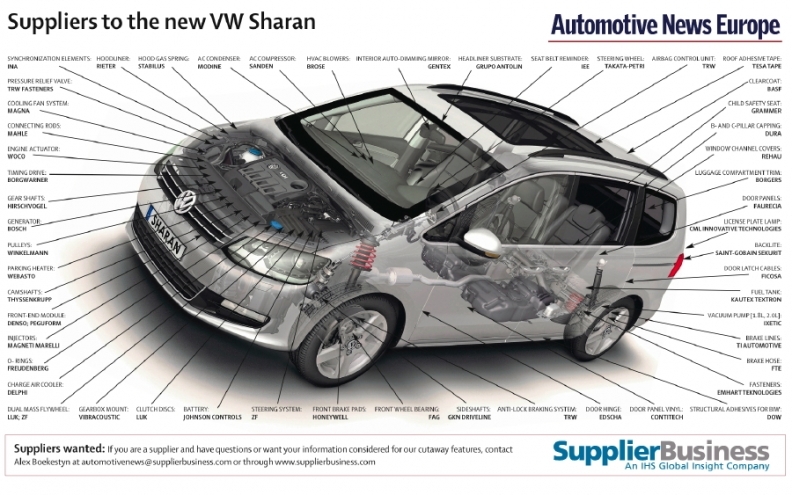 Sharan prices start from 28,875 euros (about $40,000 dollars) in Germany. Volkswagen launched the new Sharan at the 2010 Geneva auto show last March. The large minivan came available from launch with a choice of four TSI gasoline direct-injection engines and four TDI diesels. The Sharan's main rivals include the Ford Galaxy, Peugeot 807 and Renault Grand Espace.